I like young bands. Quite often they are the only thing that gives me hope, as well as something different to listen to. A little removed from Brew Town, Hartford’s The Debasers’ show vigorous initiative in pursuit of a new original sound. 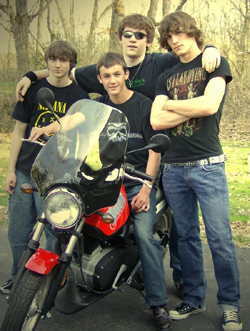 I came across them on Myspace and was drawn to take a listen by their self description. It read: “We all take turns singing songs. Jon and Holden take turns playing lead. We all write music and it’s all original. Enjoy”. What more needs to be said? In a world where bands give long and drawn out diatribes on what and who they are, this is a refreshing turn. The music is indeed original. Brash, open and tweaked with just enough tricks to entice, the tracks create a sound that is hard to categorize into any specific genre. I would simply call it good new rock. Their cd is entitled Vision of the Apocalypse. There…that’s all I’m gonna tell ya, cuz that’s all you need to know. Over the past four years, Milwaukee’s Northern Room has been turning heads with a sound that is both catchy and ambient. Layered with lush keys and beautiful droning guitars, the band has an almost U2 feel and every song seems to be set up for radio play. Tracks such as “Waiting” are almost a throwback to 80’s pop with a sound reminiscent of bands such as Ah-Ha. Their latest release “Last Embrace” is a culmination of material recorded throughout their career and shows diversity while maintaining continuity. All in all a good listen. Check out Northern Room when they hit Oshkosh September 10th at the UW’s Music and media Conference. There’s a new club on the rise. Somewhat inconveniently located on 13th and Manitoba on Milwaukee’s fashionable lower south side, Liquor Sweets is really putting together some great shows. At first look, the downstairs seems spacious with a newly remodeled stage perfect for original rock. If you venture upstairs, you will (very much as I did) freak out. The room is ginormous. With a capacity of 400 or so, the venue could easily support semi national as well as some national acts. A huge stage with fully loaded sound and lights has the capability of making even my band look and sound good. They also have a balcony. Yeah, that’s right…a friggin balcony. Check out Liquor Sweets when you get a chance MySpace.com/liquorsweets) ...as a matter of fact…check out the rest of the clubs for live shows while you’re at it. The bikers have all gone home and we need to get back to normal around here…kick it live Beeyatch! That’s all for now my little cup-cakes. Remember. If you cut me…I bleed Green & Gold. However, (oh my God I can’t believe I’m saying this) I’m really hoping the Jets get a Monday night game this year.